Even though Wada isn’t convinced about the potential of 3D gaming right now, it seems very likely that Square Enix will eventually support the 3DS. The company has had much success with a number of games created for the DS – especially the Dragon Quest series – so it seems only natural that they would move on to Nintendo’s next handheld. Hmm…This is starting to sound fishy. By no means does this news confirm Nintendo will keep the 3DS name for their next handheld, but with the trademarks we posted last night, it looks more likely. At least we’ll know for sure in less than a month! Thanks to Guillaume for the tip! The image above comes from an FCC listing filed by Nintendo and Mitsumi last month, but it’s receiving a lot of attention today. Why, you ask? 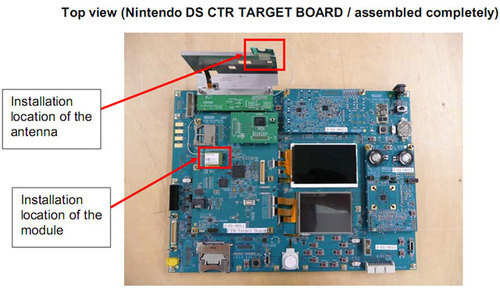 Well, some people are getting the idea that the picture is of a 3DS testbed system and indicates that the portable might feature a widescreen on top. Additionally, the FCC filing contains a request from Nintendo that the system’s contents be kept private for 180 days. However, it should end right before the big Christmas shopping season. Might the 3DS go on sale around that time? Hopefully we’ll find out next month! Renegade Kid has created some of the most impressive games for the DS since the company was established in 2007. And just a few days ago, their third title for the handheld – Dementium II – made its way onto stores shelves. Renegade Kid owner and director Jools Watsham recently took some time to answer a few questions for us about his latest game and discussed other topics, which included the possibility of developing for Wii and his thoughts about the 3DS. Nintendo Everything: Your most recent game, Dementium II, was just released last week and it looks like hands-down the scariest game on the DS system. What was the greatest challenge for actually bringing a tense, scary feel to players on a handheld system? Jools Watsham: I think the most important thing, and one of the most difficult, is to create an authentically creepy atmosphere. We also pushed ourselves to produce a ton more variety in environments and enemies, which took a tremendous amount of work. NE: Another thing that’s terrifying about Dementium II is the boxart – Who came up with such an awesome illustration? JW: I agree, I think it is fantastic. This is very unglamorous, but SouthPeak hired a talented design company who came up with it. I expect SouthPeak’s PR Queen, Aubrey Norris, had something to do with it. 🙂 The image was sent to me one day and I was just blown away. I immediately thought it looked incredible, and I felt honored to have such a wonderfully disturbing image for our game. “It really depends on this 3DS and how good it is, because I don’t think Nintendo has anything else. Nintendo is on the verge of – certainly not dropping into third place or anything – losing its dominance, because I really truly believe that Sony Move is the Wii HD. I really believe it. That’s been my quote: I told everyone a Wii HD was coming this year, it just happens to say PS3 on the box. It is the Wii HD. That’s a very easy upsell for Sony to say, ‘If you have a Wii and you really want to play high-def games on your new big high-def TV, we’ve got ’em.’ Sony is a winner and Nintendo is a loser on the console side, because the Wii Vitality Sensor isn’t going to excite anybody. But the 3DS will. If you look at Nintendo’s line-up, everything we care about is either out or known by now. People are going to like Microsoft more than we expect. Microsoft isn’t concerned about the gaming community with Natal, they’re concerned about the gaming community’s mothers and girlfriends. I really do think the gaming press has completely missed the mark on this one, that Natal is not intended for you to get up there and pretend you’re holding a rifle and playing Call of Duty. It’s intended for your mum to use the frickin’ 360 to download a movie or watch Netflix and to make it less intimidating. The cool thing about Natal is the voice command. ‘Xbox on.’ I mean, that’s cool. People will really like it when they see it and they begin to appreciate what it is. But I will say Sony up, Microsoft neutral and Nintendo down on the console side. If the 3DS is anything like those little 3D point-and-click cameras, because that screen technology is pretty cool and I’m sure it is that, it will really get people excited. Question is: what does it cost? If they get $189 for a DSi XL, do they think they’re going to get $300 for a 3DS? I don’t know. Maybe they will, but that’s a tough purchase for me. The 3DS is coming along at a really good time for them. I don’t think it’s good for the DSi XL. If they launch the thing [the 3DS] prior to holiday, I can’t imagine why anybody would buy a DSi XL this holiday. Longer term, Nintendo does really start to look bad as Apple really starts to push the iPod Touch as a gaming device, and that’s happening this holiday. Again, the gaming press hasn’t figured it out. The gaming press doesn’t really understand the 12-year-old customer, nor do you guys care. Who plays DS games? Them, not us. Nintendo’s got problems this year but the 3DS will make them look great at E3. That’s the manufacturer side. On the publisher side: Microsoft looks really good, they have a lot of content this year. People get psyched about Halo and Alan Wake will have just come out… Fable III. They have good content. I’m not sure who else anybody cares about. It’s all sequels: this year’s Call of Duty, etc. We’ve had a front-end-loaded year. We might see the Call of Duty action-adventure game but I don’t think anybody is going to get excited about that. Hmmm…I don’t even know where to begin here. The 3DS will be interesting for sure, but what about Zelda Wii? I have a good feeling that title will end up impressing quite a few gamers. Also, we know relatively nothing about the 3DS. Sure, it plays 3D games, but what else? There are bound to be other features for the system. Don’t forget that have yet to see any software for the handheld as well. Iwata also commented on software prices/space for the 3DS. Nintendo’s President stated that prices are determined by third-parties and details can only be provided over time. Additionally, Iwata provided an explanation as to why the 3DS was announced before E3. Apparently Nintendo is interested in having other companies showcase their software for the system at the event. Because of this, other developers outside of Nintendo would become aware of the portable’s significant features. Before information was released to the public and speculation ran wild, Nintendo revealed the 3DS. Last but not least, Iwata noted that is is possible that consumers will be hesitant to purchase a DS as a result of the 3DS announcement, especially in North America. However, he does not believe it will have a huge impact because the current DS buyers are not similar to people who immediately go out to purchase a system like the 3DS. The following information comes from the Q&A session of Nintendo’s investors briefing last week. “This isn’t limited to just kids, but we’re aware one in some tens of people, including adults, have difficulty with three dimensional visuals. So, while the 3D image is a special feature of the 3DS, we won’t force the player to use the 3D functionality. By making it so that the player can at all times play with [the 3D feature] off, we believe we can comply with those who have difficulty with the 3D view or those who are worried about their childs’ eyes.